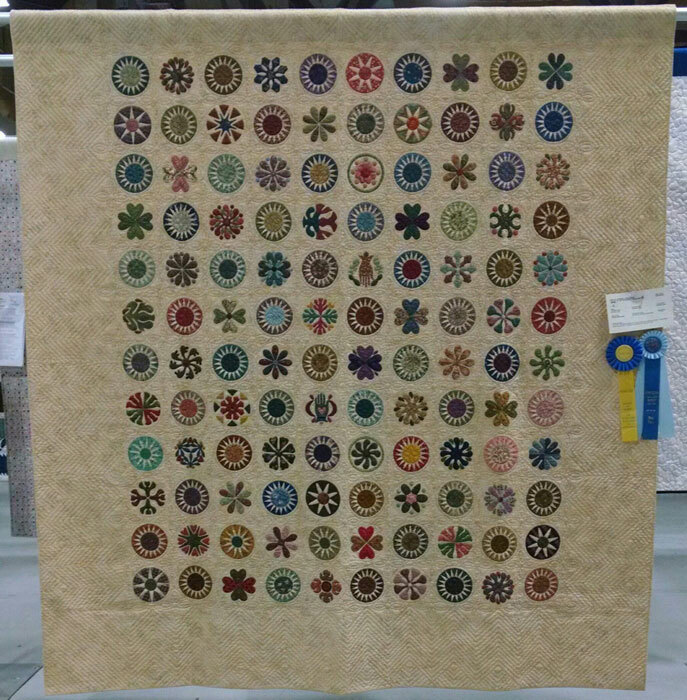 Last Thursday, April 21st, I judged at the Umpqua Valley Quilters’ Guild 32nd annual show “Stars Over Oregon” and was pleased to bestow an Award of Merit ribbon to Yvonne Cook. Certified judges in the National Association of Certified Quilt Judges (NACQJ) have the option of awarding this ribbon to a quilt which presents exemplary standards of quiltmaking excellence. Yvonne’s quilt, “Hearts and Hands,”was a stand-out for it’s workmanship and impeccable hand-quilting. Notice her beautiful zigzag border. In addition to this award, Yvonne also earned a category first place and the Viewer’s Choice award. For Viewer’s Choice, she received a shopping bag filled with quilting supplies, a gift certificate for a night at a local casino, and a $75.00 credit for dinner. Here’s wishing her the same success during her casino visit! Yvonne is an amazing talent with each new project yet another inspiration to those quilters around her who are privileged to watch these wonderful works of art evolve into the final completed quilt. She is open and sharing in her knowledge if asked. I am honored to call her a friend. Shirley, that is one of the most sincere things I’ve heard one quilter say about another. I suspect Yvonne is honored to call you a friend. Thanks for commenting.